This quote has made me think about how much of my time is spent engaging in the things that surround Cecilia Viucuña's poem and my walking practice which goes beyond the words of the poem itself. This is a drawing I made this week in an effort to try to make connections with the walking process, making knots and drawing. 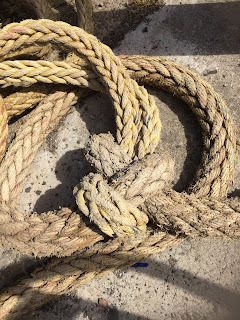 As those of you who read my blog might be aware on my walks I make ropes by hand in my studio and ask participants who walk with me to make knots in ropes to document the experience. 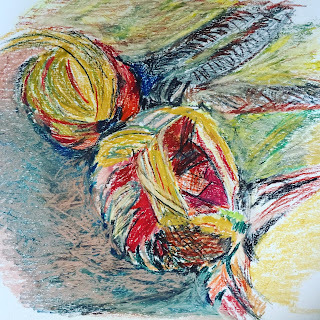 The drawing is something I want to do more of and it has been re-affirmed by my reading of Confabulations by John Berger. This reading came about as I prepare for a related walk in August with The Walking with The Waste Land group and of course there are cross-overs or maybe confabulations. and so, I keep looking carefully at ropes and knots.